The coffee at Amma's South Indian Cuisine is served upside down in a Madras-style brass tumbler set inside a metal saucer called a dabarah. When it comes to hot beverages served at an Indian meal, most Americans think of spiced chai tea. But in South India, whose cuisine lately has made great inroads into the Philadelphia region, milky cups of hot Madras-style coffee are the caffeine of choice. At the new Center City branch of Amma’s South Indian Cuisine on Chestnut Street (the original is in Voorhees), the coffee arrives in a curious brass tumbler nestled upside down inside a tall-sided metal saucer called dabarah. When you lift the tumbler, the intensely potent brew — made of dark-roasted beans from the Tamil Nadu town of Kumbakonam mixed with hot milk — fills that vessel nearly to the brim. Co-owner Bala Krishna mixes Madras coffee into a milky hot froth at the new Center City location for Amma's South Indian Cuisine. That’s when co-owner Bala Krishna steps in to show novices how it’s done. Add a hint of sugar if you like, and then begin pouring the coffee back and forth between the tumbler and saucer, artfully arcing the stream from increasing lengths in order to both cool and aerate the brew, a technique that helped give it the nickname “meter coffee.” By the time Krishna is done, it’s as frothy as a cappuccino. It’s a technique almost identical to the “pulled coffee” seen in Malaysian kopitiams like Saté Kampar on East Passyunk Avenue. Aerated Madras coffee can become as frothy as a cappuccino. In India, coffee consumption dates back to the early 17th century, when pious Muslims drank it in lieu of wine, with Madras coffeehouses becoming popular by the late 1700s. Considering it’s such an ancient tradition, it’s remarkable how long it has taken for Philadelphians to taste true Madras coffee — and a good example of the limited view Americans often see of vast food cultures, like India’s, that are diverse and intensely regional. Changing immigration patterns, though, have recently opened some flavorful new doors. 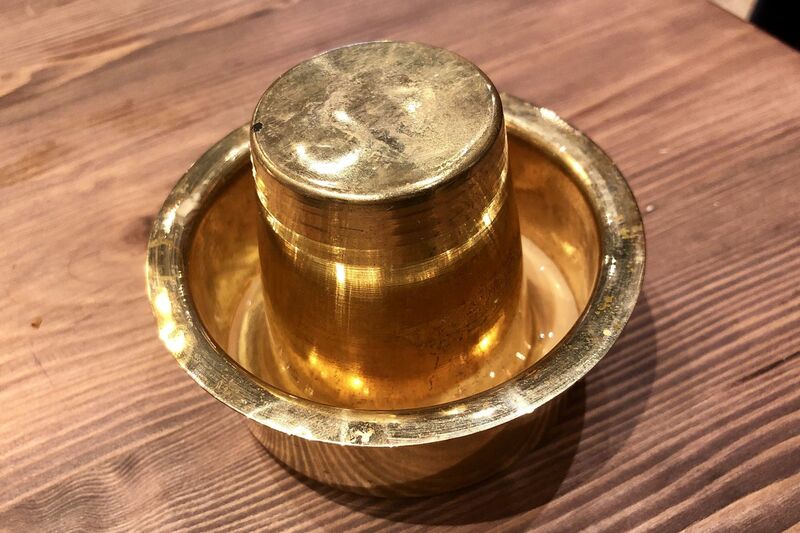 And it’s especially fun to sip it from an authentic brass (or copper) tumbler that Amma’s co-owner Sathish Varadhan says helps to give it a proper taste, a certain metallic brightness that contrasts the coffee’s naturally dark, chocolaty finish. It’s the perfect pick-me-up finale to a spicy dosa lunch.